Nature's Approach has created an aromatherapy 4 piece spa set for full body rejuvenation in your home. This economical set gives you what you need to relieve all of the daily aches and pains that your body suffers and relieve the stress experienced during your daily routine. 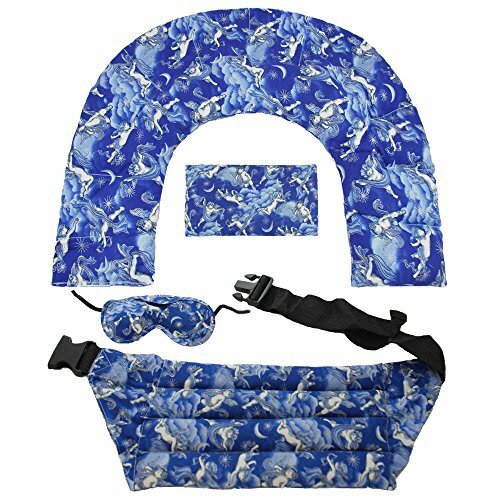 Set includes: Large Shoulder Herbal Wrap - Targets neck and shoulder pain, Adjustable Lumbar Herbal Pack - Targets lower back tension, Lavender Eye Pillow - Soothes tired/puffy eyes, Peppermint Herb Pack - Helps sinus problems. Features: Hot and cold therapy (microwave or freeze), Natural aromatherapy, Relief from aches and pains, Use anywhere on your body, Aromatherapy Herbal Pack Filling Includes Nature's Finest Herbs: Lavender, Peppermint, Spearmint, Valerian Root, Cinnamon, Chamomile, Clove, White Willow, Yarrow, Yellow Dock Root, Lemongrass, Flax Seed (provides moist heat therapy). Aches, Pains And Knots Melt Away With This Herbal Moist Heat Therapy Wrap. 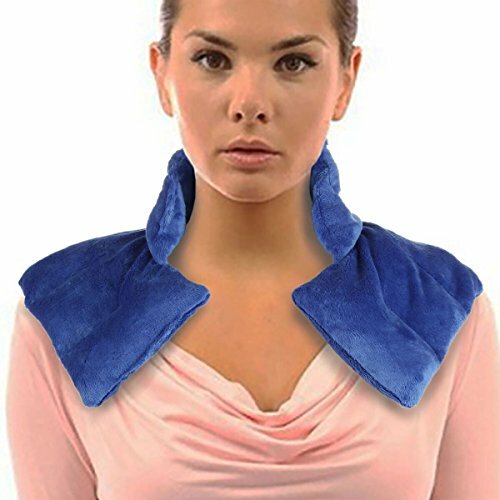 Simply microwave this luxuriously soft wrap, for up to 90 seconds, and say, "ahhh," as your stubborn neck or shoulder pain melts away. Our neck and shoulder wrap is filled with heat-absorbing clay beads and flax seeds that warm and soothe your neck, back, and shoulders.Subtle lavender, lemongrass, peppermint, and chamomile scents are released every time you heat the wrap, providing you with soothing and refreshing aromatherapy while your muscles are relaxed by the heat. You can also apply a few drops of your favorite aromatherapy oil and allow the heat to disperse the scents even more relief. Tension headaches caused by neck strain can start to fade in minutes. Also helps relieve soreness after workouts, muscle strains and pulls. Optimal heating time in microwave may vary, take care when applying to body to avoid burning your skin. Slightly moisten for even better heat therapy. Alternatively, the wrap may be used for cold therapy and chilled in the freezer for a cool, refreshing experience. 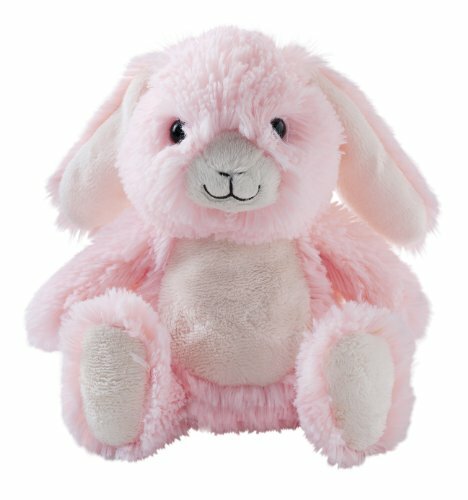 Cute and adorable our bunny cozy hottie microwave teddy will keep you warm and cozy Cozy Hotties have a removable microwavable tummy insert that is warmed in the microwave to give a lasting warmth to help your child get a great nights sleep. Made with soft fabrics they're perfect to cuddle and get warm and cozy with. The microwaveable tummy insert is filled with tourmaline beads gently scented with lavender oil, which is released when warmed, and helps aid a restful nights sleep. Let them wake up happy after have a great nights sleep, ready to play with their new best friend. Treat muscular ailments from the comfort of your own home with our extra-large heating pad, and the extra-long cord means you can choose where in your home you use it. Our heating pad is ideally suited to provide heat therapy for any part of the body that needs it, and is long enough to wrap around those areas that need surround heat. We've included a controller with a clear display panel so you can see what your pad is telling you, large buttons so you can tell it what to do without spraining a finger, and an auto-shutoff feature to keep you and your house safe from overheating and burning. The pad itself is covered in a high-quality microplush that adds to your comfort. 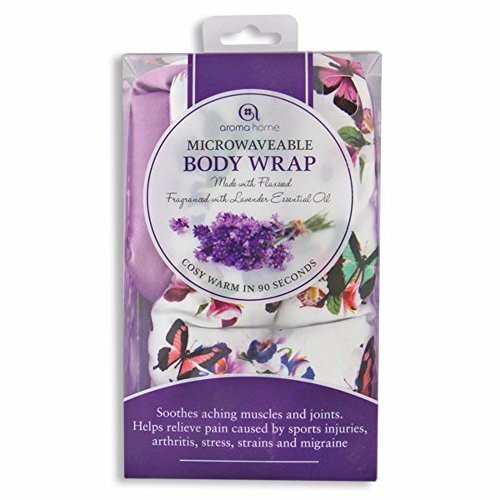 Aches, Pains And Knots Melt Away With This Herbal Lavender Moist Heat Therapy Wrap. 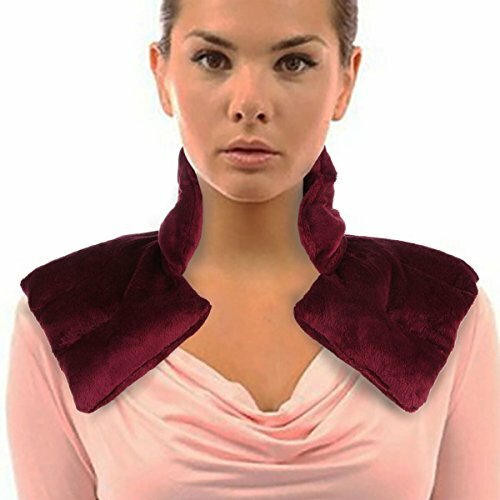 Simply microwave this luxuriously soft wrap, for up to 90 seconds, and say, "ahhh," as your stubborn neck pain melts away. You can also apply a few drops of your favorite aromatherapy oil and allow the heat to disperse the scents even more relief. Tension headaches caused by neck strain can start to fade in minutes. Also helps relieve soreness after workouts, muscle strains and pulls. Optimal heating time in microwave may vary, take care when applying to body to avoid burning your skin. Slightly moisten for even better heat therapy. This extra-large body heating wrap is a microwavable and freezable product. It is designed to be large enough to cover your entire back. 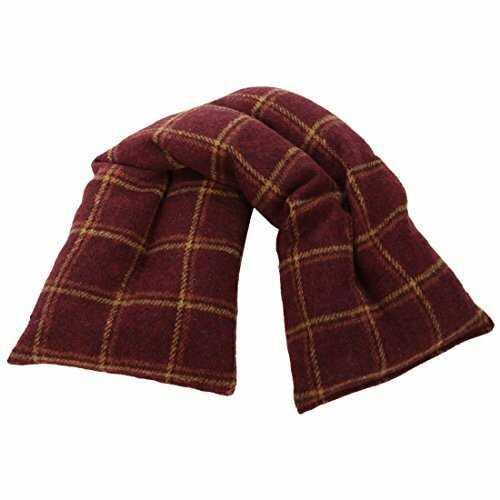 It is also perfect to wrap around your legs, knees, or shoulder and neck. Perfect for those with illness such as CFS Chronic Fatigue Syndrome, Fibromyalgia, Neuralgia, Athletic Sport Sprains/Strains or other conditions. Even office workers can easily wear this to relax their strained muscles and rid themselves of fatigue. The body heating wrap is perfect for anyone who has a need for soothing tired, sore back muscles. Sunny Bay microwavable heating pad with lavender is perfect for stress reduction, and for quick pain relief. Get your back pain therapy while on your break or on your job, as often as you like! 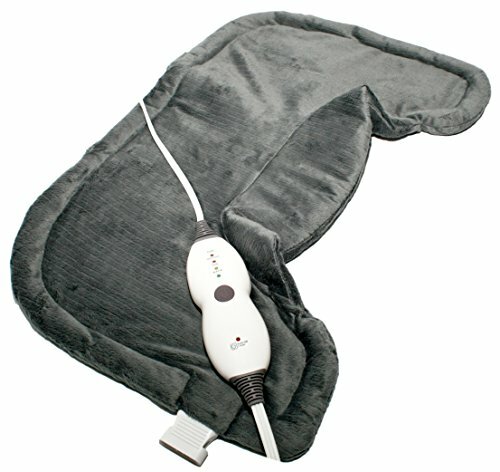 The heating pads can be microwaved or frozen for the best therapeutic use. Strong lavender-scent is the perfect choice for in home aromatherapy. for people with simple muscle strains to those with chronic pain, this heating wrap will become your go to selection for comfort and relief. Treat neck and shoulder or upper back ailments from the comfort of your own home with our extra-large heating pad, and the extra-long cord means you choose where in you use it. 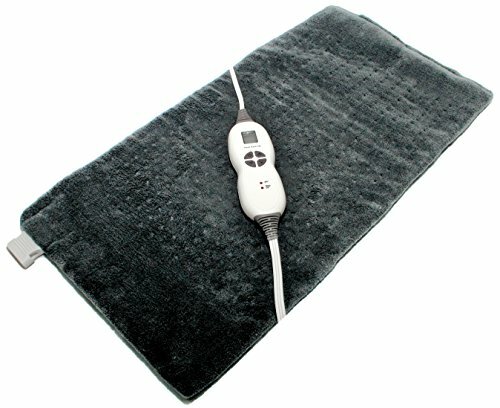 This heating pad is ideally suited to provide heat therapy specifically for those areas known for causing migraines, dizziness, numbness due to pinched nerves, and other neurological ailments. We've included a controller with a clear display panel so you can see what your pad is telling you, large buttons so you can tell it what to do without spraining a finger, and an auto-shutoff feature to keep you and your house safe from overheating and burning. The pad itself is covered in a high-quality microplush that adds to your comfort. http://www.zhu-zhu.co.uk/wheat-bags.html --- Zhu Zhu is the leading UK online retailer of wheat bags, heat pads, microwavable slippers and many other microwave and heat products. Buy Aroma Home, Intelex and more. 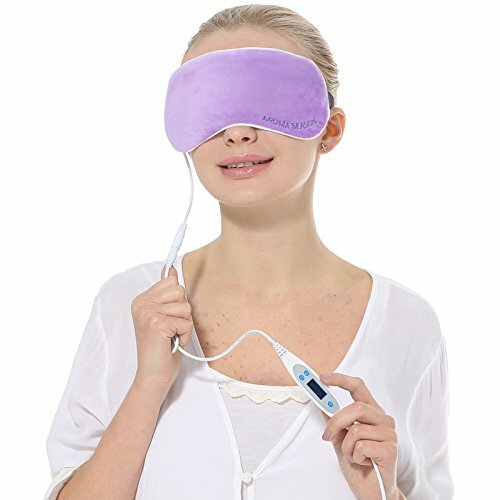 Compare prices on Aroma Home Heating Pad at ShoppinGent.com – use promo codes and coupons for best offers and deals. Start smart buying with ShoppinGent.com right now and choose your golden price on every purchase.